Photo upload in the online account members area is now available! 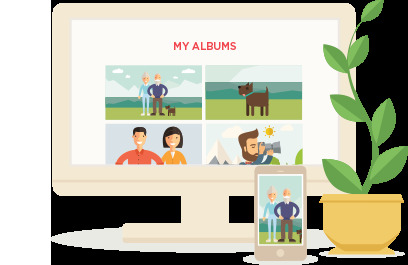 This means that you can instantly transfer photo files from your computer's hard drive (or any other folder) into your Photomyne account - and these will sync with the app. All you need is to log in online. How to upload photos online? Any uploaded photos will be synced to the respective album in the app on your device, too! To start, click the Upload photo (picture) icon or, alternatively, click the Upload photos thumbnail box showing right next to the last photo. If the photos you'd like to upload are stored in a specific folder on your computer, double-click it to open and reveal the files list. You can upload up to 100 JPG files per upload. - that's a lot of memories! 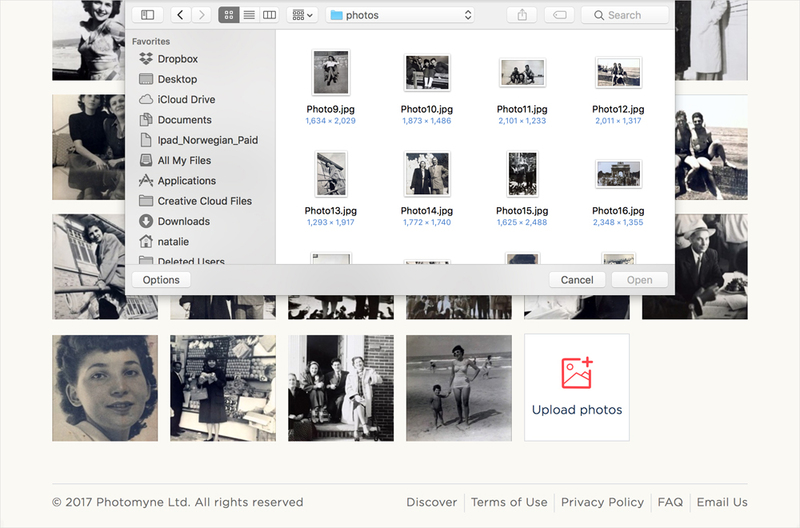 Last step: the Photomyne web portal will take it from here. The system will upload all the files you wish to add to your account. This may take a few minutes, depending on the number of files you're uploading, your Internet connection, your computer's operating system and more. By the way, you can also upload an entire album on the web. To do this, follow the same process as described above, while on your main albums page. 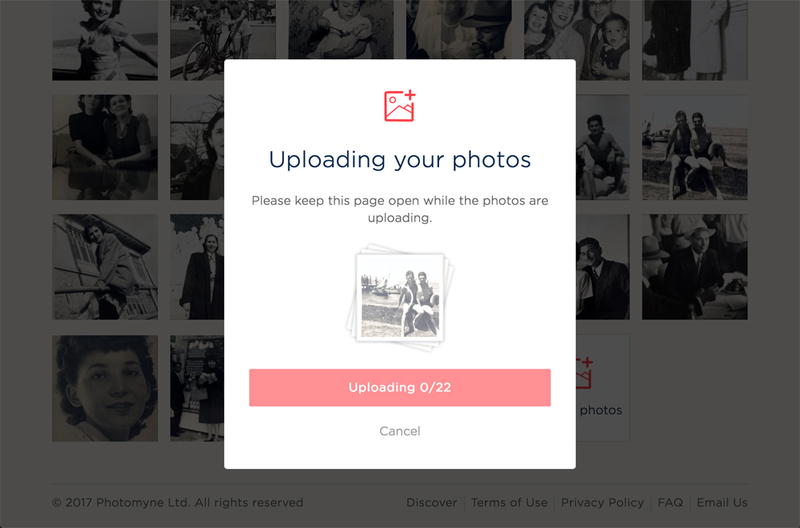 Give the Photomyne cloud a few minutes before logging in on the app or elsewhere to see the photos you just uploaded. To avoid account sync issues, and to make sure you see your most recent albums and photos scanned with the app, we recommend keeping the app closed on your mobile device before logging in online. This is to ensure seamless photo viewing, downloads, edits and uploads. Log in now to your Photomyne account online to start uploading photos. 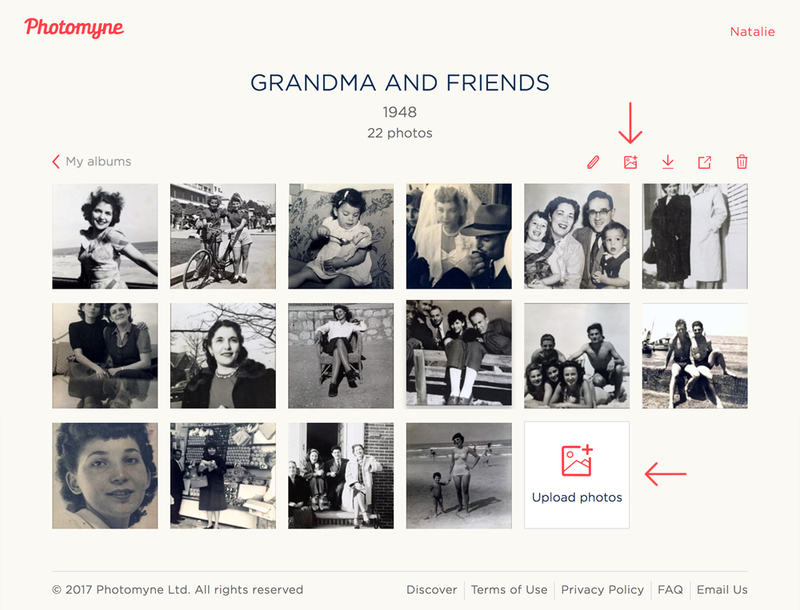 Don't have a Photomyne account yet?